One of my favorite ways to take notes is with Foldable Notes. This is an easy way to get students to create their own notes and develop the Math concepts in their own writing. 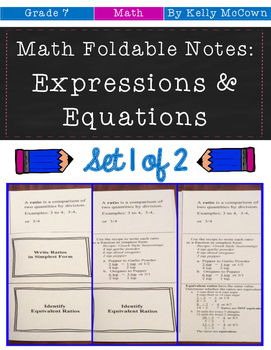 I have two NO PREP Foldable Note sets for 7th grade Expressions & Equations. These are easy to print and go! You can use a scaffolded approach or just print for absent students. It's a great alternative to traditional note taking!! 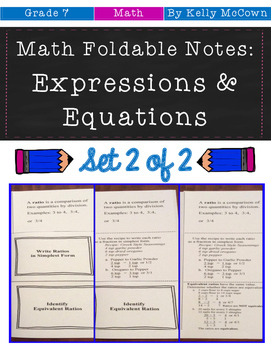 These math foldable notes are for students to be able to write and evaluate numerical expressions involving exponents, write, read, and evaluate expressions, identify parts of an expression, evaluate expressions and their variables, apply the properties of operations, identify when two expressions are equivalent, understand solving an equation, and use variable to represent numbers. These math foldables are for students to be able to write and evaluate numerical expressions involving exponents, write, read, and evaluate expressions, identify parts of an expression, evaluate expressions and their variables, apply the properties of operations, identify when two expressions are equivalent, understand solving an equation and inequality, and solve word problems leading to inequalities.